May is National Bike Month, and Hampton is hosting several events that include fun locations and interesting routes for every skill level. Words on Wheels is a tour of downtown, Phoebus and Fort Monroe on Sunday, May 6. The idea is for riders to collect letters from participating businesses and then use those letters to build a word with the highest point value. Learn more online. National Bike to Work Week is May 14-May 18 and Friday, May 18, is bike to work day. 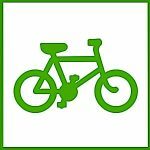 The City of Hampton is encouraging workers to commute by bike and send photos that the city can post online. Hampton will also have the second annual Tour de Fort at Fort Monroe on Sunday, May 20. Explore the historic fort by bicycle through one of five guided rides. To learn more about Bike Walk Hampton and National Bike Month, including a mayor’s ride with Mayor Donnie Tuck on May 1, visit www.hampton.gov/bikewalk. In addition, Hampton advises the public to keep bicycle safety in mind while riding or driving.